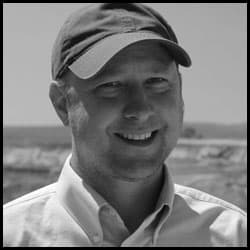 Wyoming lawmakers expressed frustration and disappointment with the state’s top oil and gas supervisor’s failure to come up with a proposal for finally dealing with what has been a slow-moving train-wreck for landowners in the Powder River Basin: operators are abandoning thousands of coal-bed methane gas wells — a human health, private property and environmental liability. The state’s ability to manage the cleanup — a boom-and-bust hangover that many in top positions agree is due in part to previous administrations’ overly-eager intent on fueling the play — is lacking. Records are incomplete. Funds available for cleanup are merely a fraction of the estimated costs. Agencies don’t have enough staff for the job. Operators that were granted compliance exemptions for three years, four years, five years, are giving up and walking away. Lawmakers are entertaining suggestions to reform the state’s oil and gas bonding requirements, and possibly raising the mill levy on oil and gas producers to generate more money for the state’s orphan well account. But first, they want to see a cleanup plan. The Powder River Basin orphan well mess was just one of several high-profile energy-and-environment issues handed to Grant Black this past spring when he started work as the Wyoming Oil and Gas Conservation Commission supervisor: there’s the Pavillion groundwater contamination investigation, increases in flaring natural gas from horizontal oil wells, and rulemaking for baseline groundwater testing, and more. In one of Black’s first appearances before a legislative committee in May, lawmakers said they weren’t satisfied with the estimated 10 to 12 years it might take to complete plugging and reclamation work on the 1,254 wells on the “orphaned” list — and that didn’t even factor in the additional 2,000 wells everyone agrees will soon be added to the list. “To wait 10-12 years to get a mess on your property cleaned up that you had nothing to do with is unacceptable,” Joint Minerals, Business and Economic Development Interim Committee co-chairman John Hines (R-Gillette) told Black back in May. At that May hearing, Grant had agreed, and said plugging and reclaiming orphaned well sites was his top priority. There are many factors at play, said Black. The season to plug wells and properly reclaim well facilities and disturbed locations is very limited — spring through fall. Some wells are high priority: those in sage grouse “core areas,” those that pose immediate human health and environmental risks. For other wells, it may be reasonable to wait several years to plug and reclaim. Black said the orphaned wells are not tightly clustered on a single surface owner’s property, so access on multiple properties is a process that requires some lead-time — and that work hasn’t even begun. He said very few in the pool of contractors that bid on such jobs have all of the equipment necessary to do the job. Not to mention the state’s industry-funded orphan well account is now at $2.8 million while estimates to clean up 3,000 wells ranges from $30 million to $90 million. A few committee members agreed they were expecting a proposal that includes how many well sites could be plugged and reclaimed — in three years, in five years, or in eight years — and an estimated cost for each scenario. “We needed to have a more definite plan with a time frame and dollars,” said Hines, who admitted some bias on the issue because he and his constituent neighbors deal with orphaned coal-bed methane well sites on their properties. Wyoming’s general response to the problem today is in sharp contrast to the resources and mandates that state and federal officials used to help drive one of the state’s brightest-burning drilling booms. For a period of about 10 years, dozens of operators —about 150, at one point — drilled at a pace of 2,500 wells annually, tapping rich coal seams only 500 to 1,000 feet below the surface. 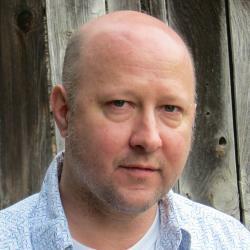 Then the play fell off a cliff in 2007 — due in no small part to the United State’s proliferation of shale gas production. And the fall has been pulling a handful cash-strapped operators, one-by-one, into bankruptcy, while the vast majority of wells are idled and properly maintained by well-financed operators. There are 1,254 wells listed on the OGCC’s orphaned well list (last updated in May 2013). 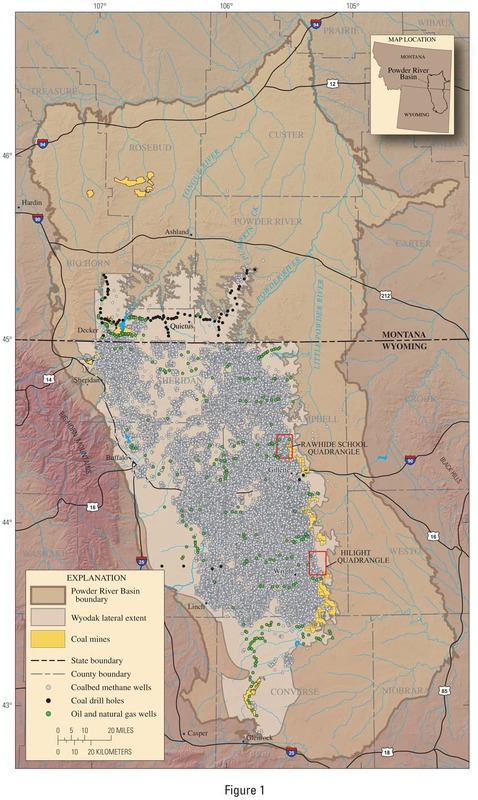 Using the state’s own data, Jill Morrison of the Sheridan-based landowner advocacy group Powder River Basin Resource Council, noted that since 1997 the Wyoming Oil and Gas Conservation Commission has reclaimed a total 437 wells at a cost of $5.8 million. A 2009 University of Wyoming study suggested that, adjusted for inflation, the average cost of plugging a well in Wyoming from 1997 to 2007 was $27,555, putting the total potential cost to reclaim the 1,254 wells currently on the orphaned well list at $34.5 million. The same UW study suggested a new formula for setting reclamation bonds in the oil and gas industry. Primarily, the state should link bonding rates to production, and account for loss of surface land value. The study pointed to weaknesses in the current system. “One of the big shortcomings of the current bonding system is that it does not properly handle the time value of money,” according to the study’s authors. Morrison suggested three revisions to rules and state statutes to address the Powder River Basin coal-bed methane orphan well problem and to ensure something like it doesn’t happen again: Increase the mill levy on operators for produced oil and gas and possibly raise the current mill levy ceiling; base bonding requirements on site-specific considerations; and place into statute that no operator that fails to live up to its bonding and reclamation duties can buy leases or operate in the state again. “It’s clear to me that something more needs to be done,” Morrison testified to the committee. “Our landowners and mineral owners are sitting out there with orphaned wells, trying to ranch around those (orphaned well facilities).” And, they’re not being paid surface damage payments. Morrison and others commended outgoing Office of State Lands and Investments director Ryan Lance for beginning to seek such assurances of operators on state trust lands. 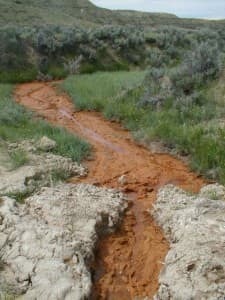 (UPDATE, September 30, 2013): Of the approximately 29,000 coal-bed methane gas wells drilled in the Powder River Basin, some 13,000 are on federal minerals, which is under management of the U.S. Bureau of Land Management. Wyoming BLM estimates there are 950 idle wells on federal minerals throughout all of Wyoming, 379 are in the Powder River Basin, and about 190 of those are coal-bed methane gas wells. BLM officials say the know of no orphaned coal-bed methane gas wells in basin. 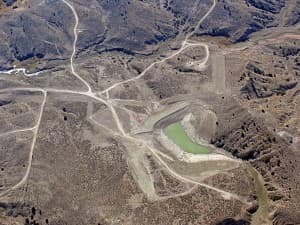 To drill on federal minerals in the United States, an operator must pay a minimum blanket bond of $25,000 in each state that it operates, or $150,000 for a nationwide blanket bond — standards that environmental groups say doesn’t begin to cover the actual liability of oil and gas well facilities. The U.S. Department of Interior is currently reviewing its oil and gas bonding requirements. I wish legislators were more thoughtful about whom they took to bed. Courting gas and mineral developers brings out such weakness of character, and all those dollar signs make the eyes blind. If we can legislate to take better care of this land, Wyoming will be one of the nation’s crown jewels when few others have wild land and clean(ish) air and water to provide their children. If we can just choose the future over today’s pocketbook… I earn very little money, have no clout or influence. And I have no children or grandchildren. But, oh, do I have hopes someone will step up to provide leadership and true prosperity for those who do. Many of these wells might be good candidates for conversion to groundwater monitor wells, a resource that is in short supply in this state. An analysis of wells should be made to determine which wells would be suitable for long-term monitoring of groundwater levels and quality. 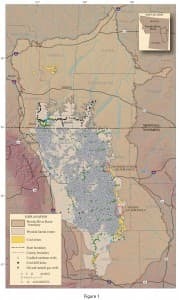 Such a study could be funded through WSEO, WDEQ, and/or OGCC in cooperation with the USGS to establish a long-term, reliable groundwater network in the state. The principal problem arises from the fact that the legislature refused to require appropriate bonds on these wells because they were blinded by the lure of immediate cash from development. OGCC, PRBRC, and others suggested higher bonds multiple times, and each time our legislators cried and moaned about how even the slightest increase in cost would devastate development and production. Now these same clowns are trying to hold OGCC’s feet to the fire when the agency has no resources to deal with the problem. The real fault lies at the feet of the legislature. They’re kinda like renters. We should ask them to pay a security deposit before being allowed on the land.